We are comparing Skip line Vatican Museums and Sistine Chapel Prices from leading ticket suppliers and Try to find you Cheap tickets prices on the market. 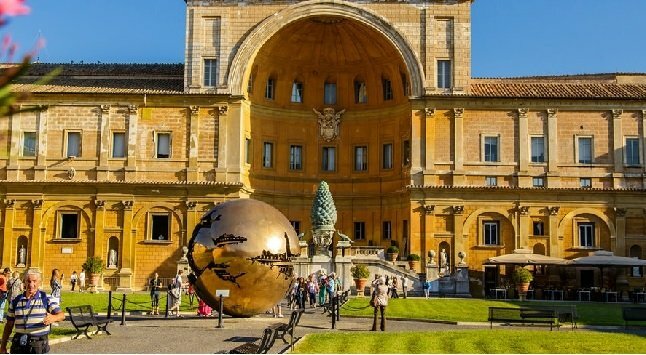 Start exploring the history of Renaissance art, religion and Italian culture in the official home of the Catholic Pope. With a Skip the Line entrance ticket you'll save time and gain fast track entrance to the Vatican Museums, and their 54 galleries, as well as entrance to the magnificent Sistine Chapel. Inside the Vatican Museums you can find over 20,000 artworks by Italy's most renowned artists, as well ancient sarcophagi belonging to the mother and daughter of Constantine the Great. Don't feel overwhelmed because the upside of visiting independently is that you can take a break or leave the museums whenever you want to. Take your time to browse the Gallery of Maps and the Cabinet of Masks, admire the finest works of Renaissance artists, Raphael, Botticelli, Michelangelo and Rossellini, and discover the jewels of the Sistine Chapel. Browse the galleries of statues, maps and tapestries, or peer into the cabinet of masks before visiting the Raphael Rooms. Take as long as you like to explore the Vatican Complex and feel free to skip any parts which aren't your cup of tea because on this tour you're the guide. This ticket also grants you fast track entrance to the Sistine Chapel at you're reserved time so there'll be no need to waste your precious holiday time waiting in lines. The skip the line entry ticket is aimed at travellers who prefer to visit attractions independently and visitors who enjoy the flexibility of a self-guided tour. This is also a good option for anyone who wants to explore the Vatican City because skip the line entry will save you a lot of time, particularly during peak season. Your Experience With Skip line Vatican Museums and Sistine Chapel? Get fast-track entrance and skip the long lines to the famous Vatican Museums. Meet an official representative who will direct you the fastest entrance to the Vatican complex. See the works of world-famous artists, including masterpieces of leading Renaissance artist, Michelangelo. Visit the Gallery of Maps, the Raphael Rooms and the Greek Cross Gallery. Discover the sarcophagi of ancient kings and queens and walk among the magnificent beasts that lurk in la Sala degli Animali. Marvel at the frescos in the official home of the Catholic Church, the Sistine Chapel. Most importantly, don't feel rushed, take advantage of the self-guided tour to discover this labyrinth city at your own pace. What Skip line Vatican Museums and Sistine Chapel Includes? Priority Skip the Line entrance ticket to the Sistine Chapel and Vatican Museums. Skip the line entry to St. Paul's Basilica is not included with this ticket if you want to visit the Basilica we recommend that you go early to avoid long queues. Travelers Reviews about Skip line Vatican Museums and Sistine Chapel? Visiting the Vatican Museums and Sistine Chapel is one of the top things to do in Lisbon. Thousands of travellers have given the skip the line entrance ticket very positive reviews on Get Your Guide, saying that the service was professional and organised. Meanwhile TripAdvisor users have left a 4-star rating, comments mostly agree that ticket is good for time-saving and worth the money. Some tickets are none refundable, please check with tour supplier. Priority entrance is for your selected time slot; late arrivals cannot enter. Audio guide is available in English, Italian, Spanish, French, Portuguese, German, Russian, Chinese, Japanese and Korean. Students should bring a valid student ID. Meeting Point will be confirmed in the booking confirmation.